The idea for Ultimate Workout was created by Chris Blake, editor of Insight Magazine at the time, who was running on a treadmill with a friend. They began to talk about the importance of giving their souls a workout, along with their bodies. How could they make their sweat count for eternity? Chris couldn’t get the conversation out of his mind and began dreaming up ways to encourage teen readers of Insight to exercise their faith. Soon the magazine teamed with Maranatha and the Ultimate Workout, as we know it, was born. The first adventure consisted of 14 teens. Now more than 25 years later, Maranatha welcomes around 150 participants to Ultimate Workout each year. As with all Maranatha projects, Ultimate Workout revolves around the construction of a church or school. Volunteers are usually split into smaller teams which work on separate sites or together at one place, depending on the project. There are also opportunities for volunteers to jump into various outreach efforts, such as medical clinics, community service, and children’s ministries. In addition to the work, the Ultimate Workout is intensely focused on spiritual and leadership development. 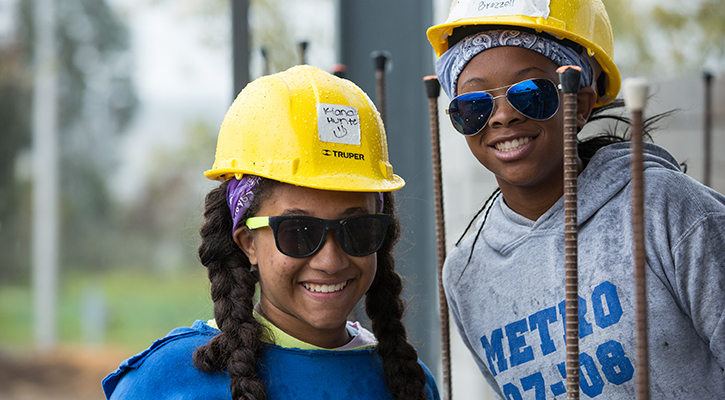 Teens lead out in many areas, including worship, construction, and outreach. Faith is stretched and strengthened in incredible ways while out in the mission field! There is also time for much socialization. Strangers quickly become close friends. And there is always a fun excursion to get to see a little of the country. From there, volunteers usually keep in touch, reconnect on another Ultimate Workout or mission trip, and sometimes even meet in college! The Ultimate Workout is an annual international teen mission project sponsored by Maranatha Volunteers International. It is intended to give teens a physical and spiritual workout through service activities. What are the age requirements for Ultimate Workout? The Ultimate Workout is a high school experience. We accept volunteers who have completed their freshman year of high school up through recently graduated seniors who have not yet begun college. Do you have to be Seventh-day Adventist to go on Ultimate Workout? No. We accept volunteers from all background and religious affiliations and Ultimate Workout is open to ALL teenagers who have completed grade nine. We do ask that volunteers remember that Maranatha is an Adventist Christian organization, so there is an intense spiritual component to the trip. Participants should desire to reflect Christ’s love with the communities where we work as well as understand that spiritual discussions and activities will be part of the experience. We also ask that volunteers respect Adventist values while on the project. What is the cost for Ultimate Workout? Expenses can vary, but typically volunteers pay a participation fee that is between $800 and $1,000, The participation fee covers your food, housing location, in-country transportation, insurance, an excursion, t-shirt, and Bible. The fee also contributes to the cost of building the church. When applying, volunteers must pay a deposit. The remaining balance of the participation fee must be submitted before the final deadline. The participation fee does not cover passport fees, airfare, vaccines, souvenirs, or purchase of items on packing list (if you don’t already own them). Is it OK for my child to travel alone to another country? Wear the Ultimate Workout t-shirt provided while traveling! At some point in your travel, you will probably see other volunteers wearing UW t-shirts. Don’t be afraid to introduce yourself and travel together. Join the Ultimate Workout Facebook Group and ask about travel itineraries. If you meet another volunteer with the same route, plan ahead of time to connect at the airport. Airlines offer assistance to minors by having chaperones between connecting flights. You can request this, but this does mean they will not be allowed to interact with other UW travelers between flights. Keep Maranatha’s emergency number with you while traveling. If you miss a connection or if your flight is cancelled, you can always call us and we will help you figure out the rest of your trip. When you arrive at your destination airport, go through customs, pick up your bags, and then exit into the lobby. Our staff will be wearing the UW t-shirts and looking for you! If you ever feel anxious, ask airport personnel for help! How can I find the best airfare? Does Maranatha have a travel agent? Is there an airline discount available since so many people are going on this project? We encourage you research for the best airfares. There are a number of online travel sites that search for the lowest airfare. You can also contact local travel agents to see if they can find a better deal. Maranatha recommends two different travel agents in the information packet. BE SURE you have the correct dates and times BEFORE purchasing your tickets! Unfortunately, Maranatha does not have a travel agent on staff and we do not have a group discount since the volunteers are coming from many different places. Participants should purchase a flight from their home airport that matches the guidelines in the information packet. Do not purchase a ticket until the participant has received confirmation from Maranatha that they are accepted to the project. What diseases are present, and what vaccinations will I need? Check out the website for the Centers for Disease Control and Prevention (CDC) to look up health advice for travelers to specific regions. We provide additional information about the specific project location in our Ultimate Workout information packet. Maranatha requires that all our volunteers have a current tetanus shot prior to traveling. In addition, each individual should make their own decisions regarding vaccinations and prophylaxis. Do your research early as the vaccine process could take a couple of weeks and some specific vaccines require multiple shots. We recommend speaking with a travel clinic doctor at least a month prior to departure. Will my child be supervised? What is the adult/student ratio? There are adult staff members that will supervise and mentor the teens. Christian staff members have been recruited especially for their interest in mentoring teens. All staff goes through a screening and background check process as well as in-country training prior to the project. Maranatha strives to keep a 1:4 ratio of adults to teen participants. I’m an adult. Can I go on the Ultimate Workout? The Ultimate Workout is for teens but there are opportunities to serve in a staff role. Staff members should have a desire to work with teens and nurture their spiritual development. If you are interested in serving as a staff member, please contact Maranatha. Can I join my son or daughter on this trip? Not unless you are fulfilling another staff role such as medical provider, construction superintendent, etc. By not opening this project up to parents, teens are forced to branch out and meet new people. Rather than staying in their comfort zones, they learn to depend on God who is always there for them. If you feel strongly about joining your child on a mission trip, please check out Maranatha’s other mission projects including the Multiple Group Project for small teams and our popular Family Projects. What official documents are needed? All participants must present a passport that is valid for at least six months after the scheduled return date from the project. Apply for a passport through the U.S. Passports and International Travel website. You can find more information about entrance requirements at the U.S. Department of State website. All visitors under the age of 18 must present notarized written permission from any legal guardian or parent not accompanying the minor. This permission must include the names of the parent, name of the child, name of anyone traveling with the child and notarized signatures of all absent guardians. If the parents are divorced, both must sign the form in the presence of notary public, although they can sign separate forms if necessary. If sole custody has been designated, please include copies of that court document, and if one parent is deceased you’ll need to include a copy of the death certificate. These precautions are necessary to avoid problems with local officials. There are lots of ways to raise money for a mission trip. One of the most common ways of raising funds is through a letter appeal. Check out Maranatha’s Resources page to find more fundraising ideas.